Challenge Air was created to change the perception of children with special needs through the gift flight. 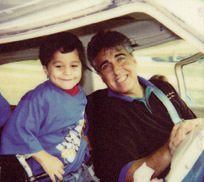 Since 1993, we have been committed to making a difference in the lives of children with special needs. With a network of 3,500 volunteers nationwide, we continue to grow through events called Fly Days. By eliminating the belief that they are limited, the children can grow to their full potential. They are given the opportunity to find courage within themselves and build in areas where they lack self-esteem. Challenge Air provides an unforgettable growing experience that opens the door to possibilities while allowing the children to see if they can fly a plane they can do anything. Rick Amber founded Challenge Air in 1993 after overcoming his disability through several activities. He became a quadriplegic in 1971 when his jet crashed during a landing attempt on a naval aircraft carrier. After competing in and winning the U.S. Open National Wheelchair Tennis Championship, he wanted to use his accomplishments to encourage children to overcome their own disabilities. That’s when Amber decided to get back to his true passion – flying. The idea of Challenge Air took off after Amber invited a group of physically challenged children on a flight over the Addison skyline. He realized that overcoming his disability helped the kids change their perception about disability. The only person that is limited is one with a limited mind. Once that barrier is broken, one’s true potential can be reached. Amber passed away in 1997 after battling cancer, but his legacy and impact live on through Challenge Air.